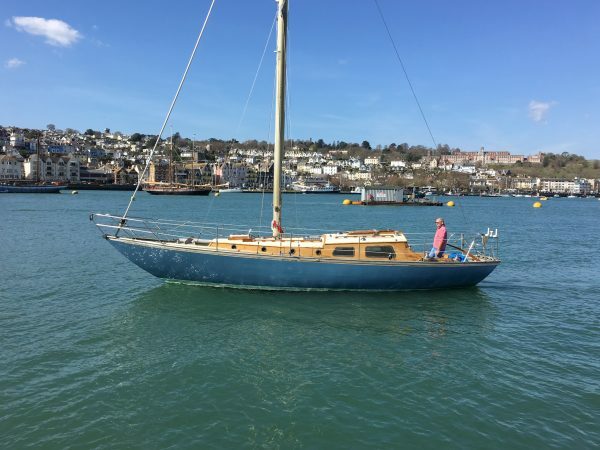 Designed and built by Morgan Giles of Teignmouth in 1958, she was the result of a commission from the then Lord Devonport for a capable offshore racing yacht, a role which she proved more than capable of fulfilling. Using modern construction principles she was something of a benchmark design in the 1950’s and although a one-off design many of the elements found their way into subsequent designs. 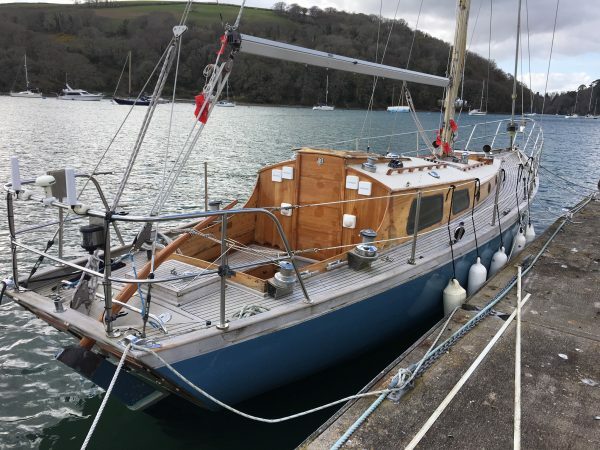 Now in only her third ownership, she was found by the current owners following an extended lay-up and in need of some TLC in 2000. 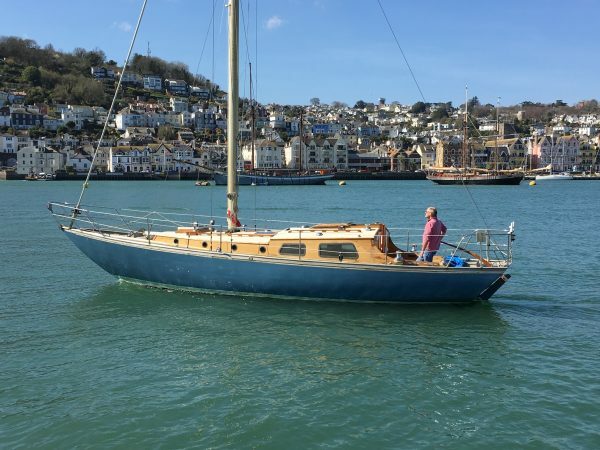 As a professional shipwright the current owner embarked upon a four year restoration of the boat which saw her stripped back to a bare hull and deck structure before being completely rebuilt. 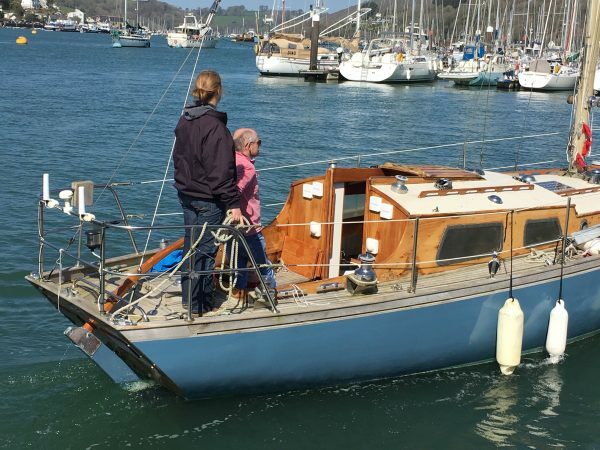 Since being relaunched she has completed more than 8000 miles of cruising exploring waters from La Rochelle to the Pentland Firth. 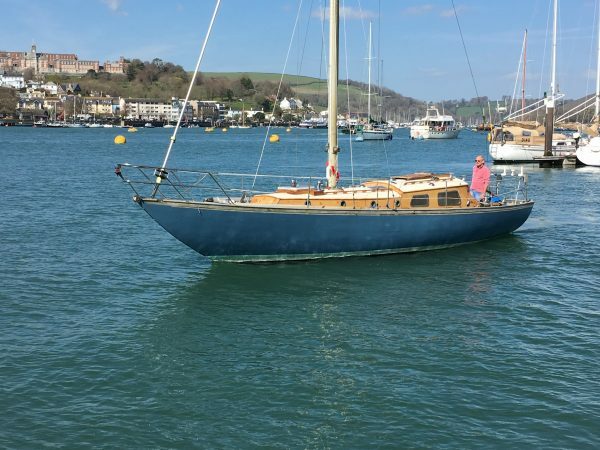 This is a very manageable yet capable cruising yacht in superb condition, ready to go sailing this summer. 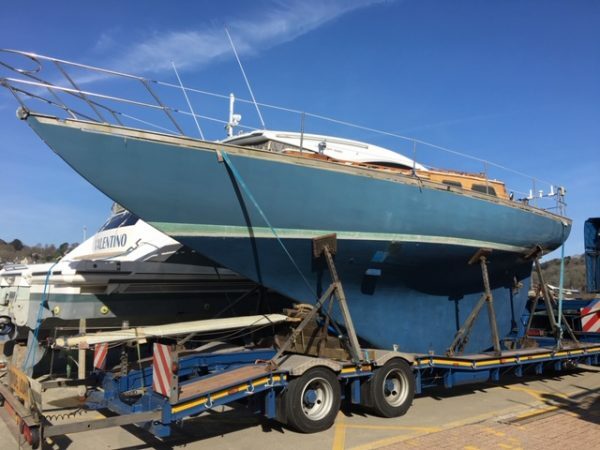 With a detailed refit history any new owner will be confident of the quality of boat they are taking on. Recently relocated to Dartmouth. Planked in mahogany all copper fastened to oak frames. 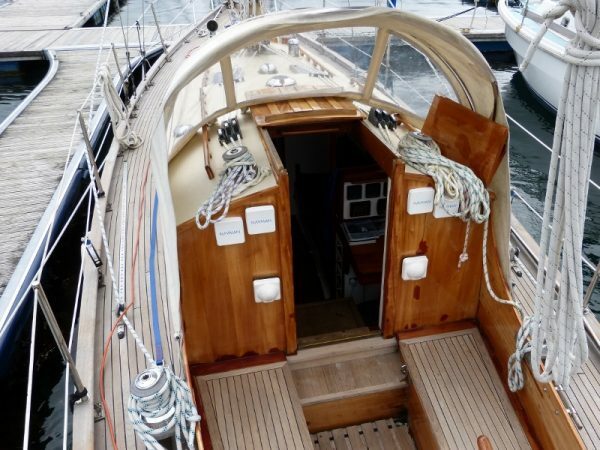 She is planked tight seamed with a glue joint between the seams from new, a modern method in her day with no caulking used. Hull finished with epoxy primer and Awlgrip topcoat. External lead ballast keel with bronze keel bolts. 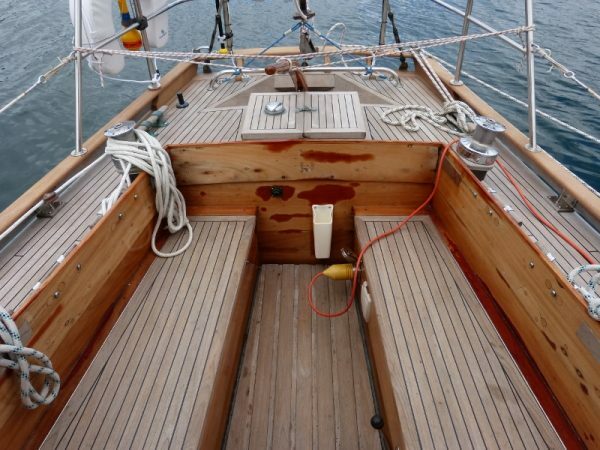 Yacht laid teak deck glued to a marine plywood sub deck. 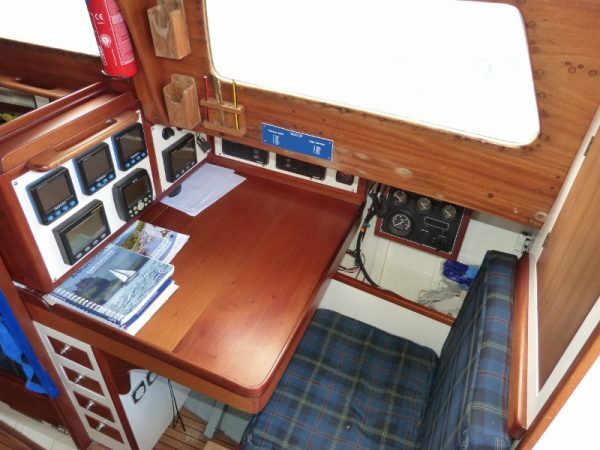 Deck new in the refit. Varnished mahogany coachroof coamings with bronze windows and portholes. Sheathed plywood coachroof deck. with a raised doghouse aft. 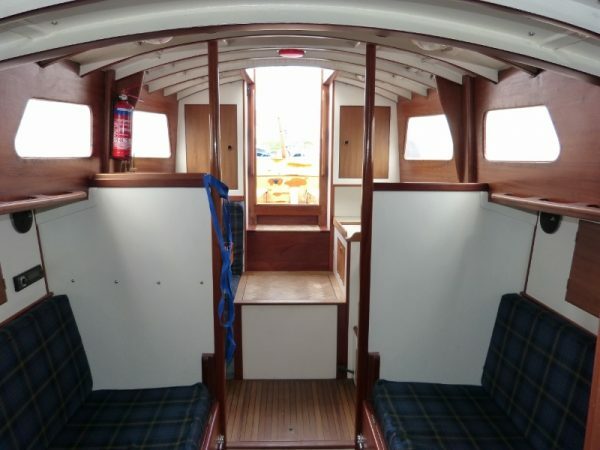 Varnished hatches and handrails. 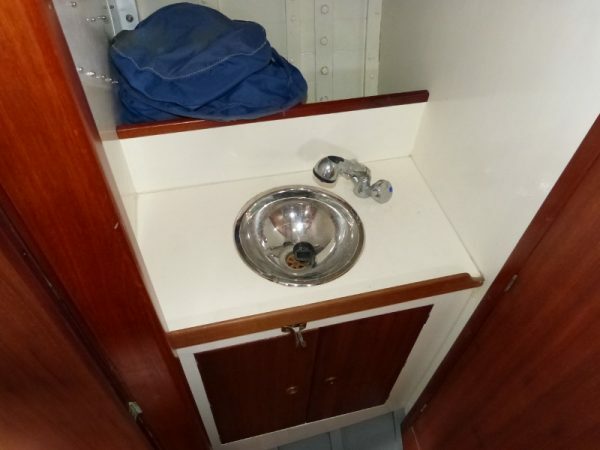 Self draining cockpit with scrubbed teak cockpit thwarts giving access to deep lockers. Masthead bermudan sloop rig on a deck stepped Proctor alloy mast. 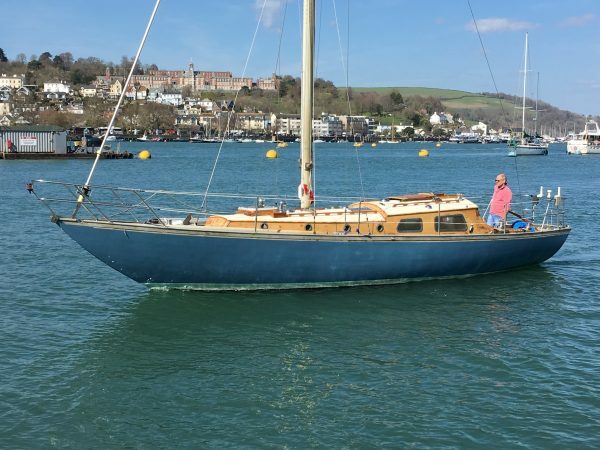 Alloy slab reefing boom and alloy spinnaker pole. Stainless steel standing rigging to internal stainless chain plates. Running rigging recently replaced. 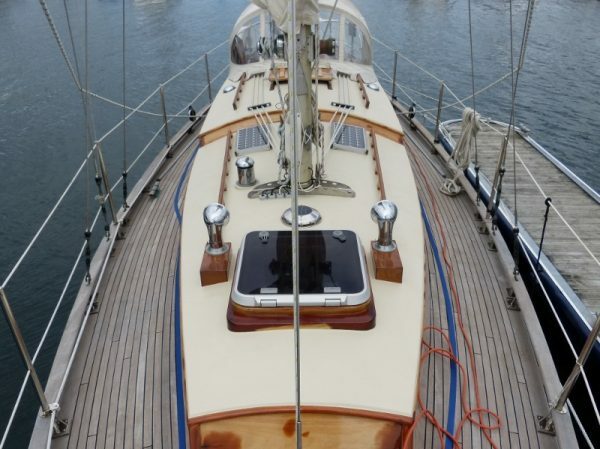 Main halyard, kicker and reefing lines led back to the cockpit. 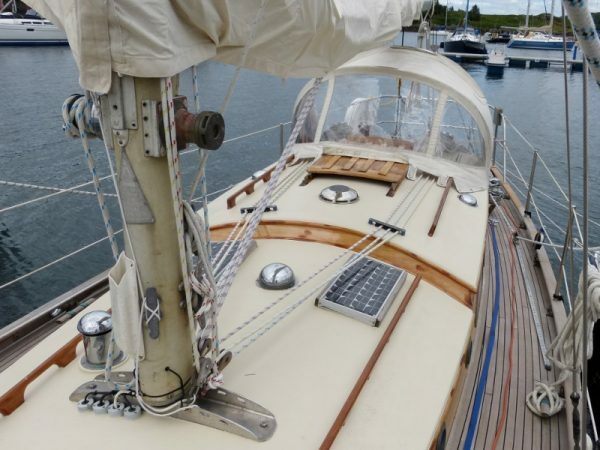 Profurl roller reefing headsail system. 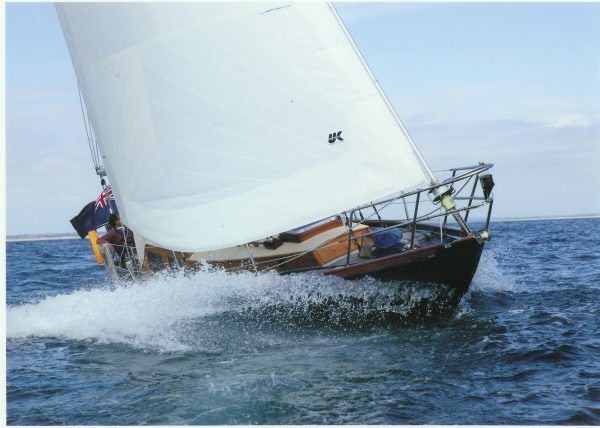 Extensive sail wardrobe with 2005 main and genoa. 2 pairs of cockpit sheet winches plus halyard winches on the coachroof deck and mast winches. 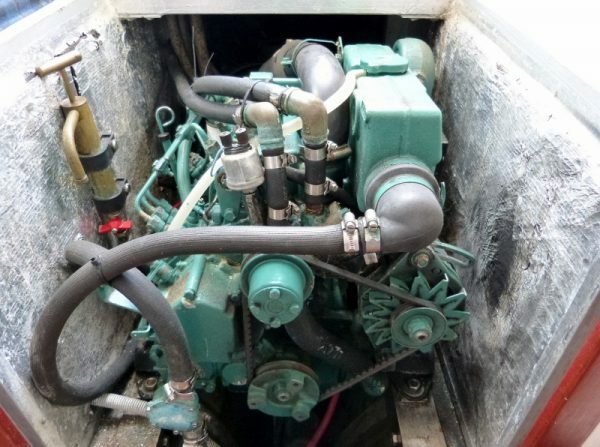 Volvo Penta MD2030 29hp marine diesel fitted new in 2004. Single lever controls to a centreline 3 blade feathering Darglow propeller. 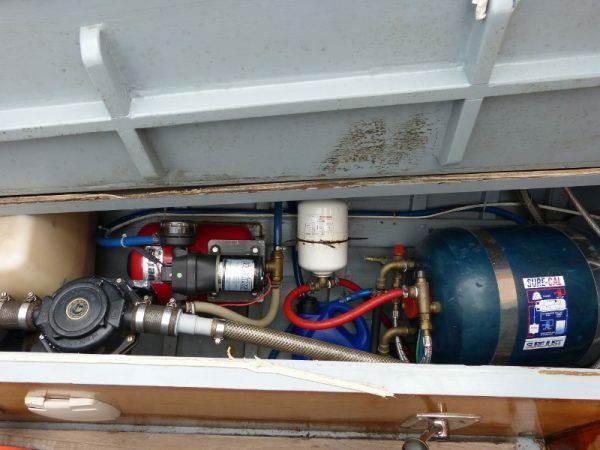 2 plastic fuel tanks, total of 120l diesel. Single engine start battery and 2 x 108ah domestic batteries. Charged from engine alternator or through 240v charger and installed shore power system. 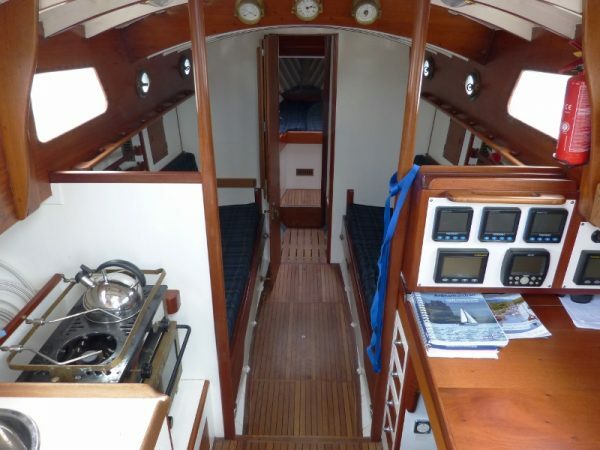 Steps down over the engine box with the galley to port and chart desk to starboard. 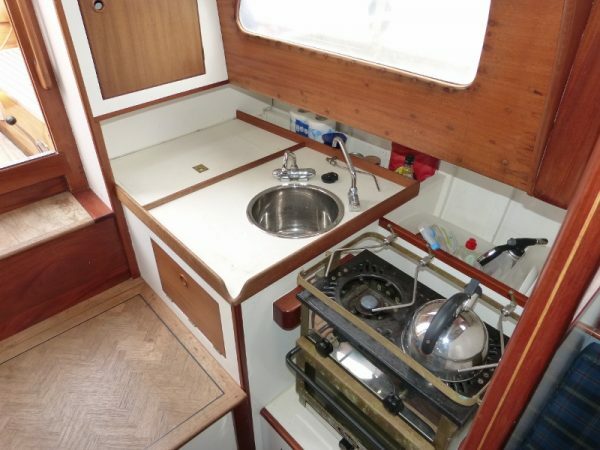 Galley has a Taylors paraffin stove with oven, single stainless sink with pressurised hot and cold water plus ample storage. Forward facing chart desk with a comfortable seat and a locker behind. All switches and nav instruments are close at hand. Half height bulkheads with vertical hand rails separate off the main saloon. 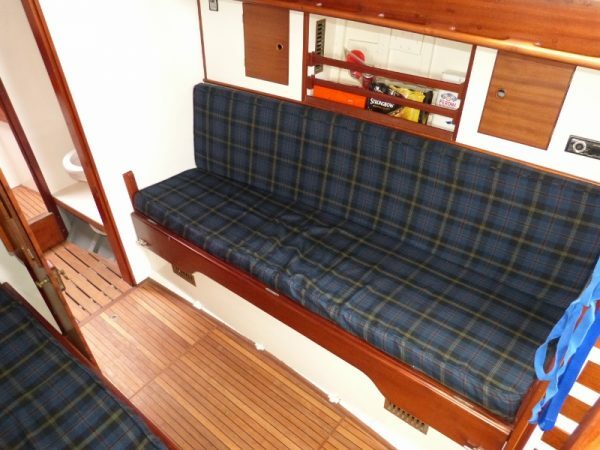 Settee berth either side with lockers and shelves behind. Centreline door going forward through a bulkhead. 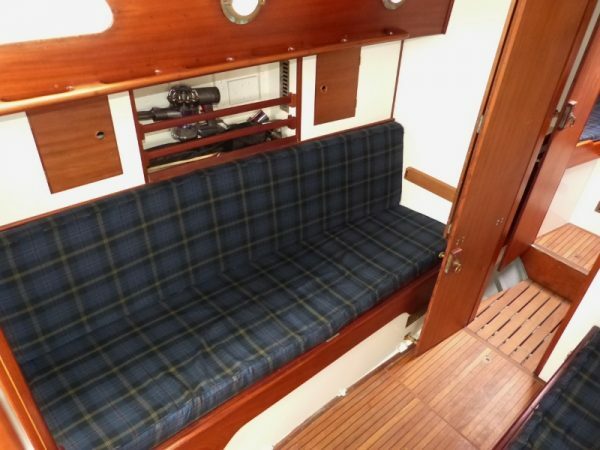 Heads compartment goes the full width of the boat using the two doors to separate it off. 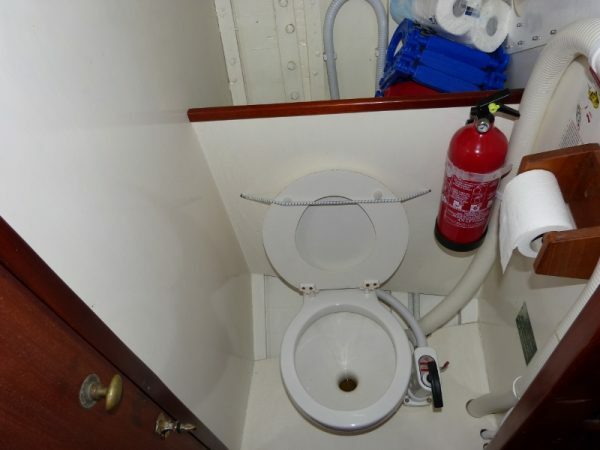 Manual sea toilet to port which discharges directly overboard and a hand basin to starboard with hot and cold water. 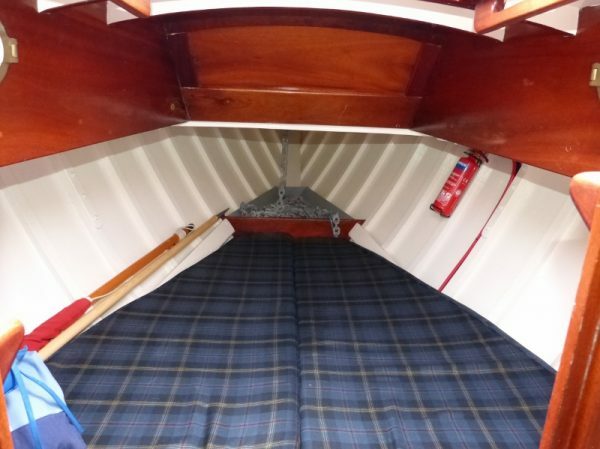 Forward into the fore cabin with a double V-berth and the chain locker forward.